Sonke has chosen not to sign the Global Gag Rule because we know the costs it represents to women’s health and lives in South Africa and across the continent and the world. 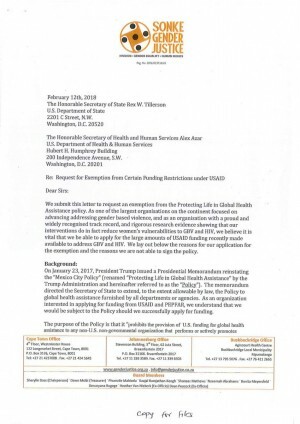 This means we, like many other organisations, can not apply for funding currently on offer from the US Government to address gender based violence and HIV, even though we’ve now built very strong evidence from many studies that our work decreases levels of gender based violence, increases people’s use of HIV services and strengthens their commitment to take local action to address GBV and HIV. We have attempted to ameliorate the effects of the GGR by applying for an exemption from the Policy. We wrote to Secretary of the US Department of State, Rex Tillerson on 12 February 2018, requesting that we are exempted from the Policy. We have received no reply to date.